The price you found is 24% lower than this hotel's average rate of $269/night. The price you found is 13% lower than this hotel's average rate of $223/night. snow machines work 24/7 in front of the rooms. dezibel >80 even during the night has to be accepted. Management can not help. In other countries you have to close your hotel at this noise level! Employees very friendly, especially the concierges and the guys at ski in/ski out. So sorry that the snow guns and cats were disturbing...unfortunately (and fortunately) we are right on the ski hill. You can request valley view rooms which face away from the mountain and will be less noisy in the mornings. Thank you for the kind words about our employees and concierges...they certainly appreciate the positive feedback! 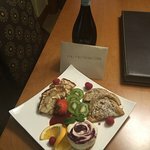 My Husband and I arrived for our honeymoon at One Ski Hill Place and We instantly fell in love with the staff and the resort! They treated us like royalty. This is a family friendly resort but also good for couples. I cannot say enough great things about this place. Nicole left us the sweetest hand written card and had desserts and Champagne awaiting us in our room upon our arrival. KK helped us check in, told us everything we needed to know about the resort and Breckenridge...she and Nicole are precious!! 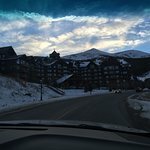 One ski hill place is close to everything in Breckenridge yet not in the middle of high traffic areas. We will stay here every time we visit Breckenridge in the future. First and foremost Congratulations! Thank you so much for choosing One Ski Hill Place for such an incredible event. I am so happy to hear that you enjoyed our staff and were impressed with KK and Nicole's guest service. I look forward to welcoming you back to One Ski Hill Place for your anniversary! This Place is the BEST! They have a bowling alley, media room, splash pad, jacuzzi, dry and wet sauna. The staff is very friendly. Just like any hotel the convenience store is a rip off. Beware of altitude sickness as well. My youngest son did not feel well for approximately 12 hrs. After the acclimation he was fine. Thank you so much for your review and for saying we should be #1 on TripAdvisor! 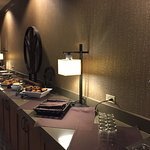 I am so pleased that you enjoyed the bowling alley, the media rooms, as well as the aquatics center and that you found the staff to be friendly. I am sorry to hear that your son didn't feel good for the first 12 hours, but glad to hear he felt better after. I look forward to welcoming you back to One Ski Hill Place in the near future. A place to call home away from home, this condo style hotel offers everything one and their family could hope for. There is a bowling alley for excess fun, and a lot of spa baths to frolic in. The only bummer is that there are no food holes for diner on the property but the town offers plenty of amazing restaurants. Thank you so much for taking the time to review One Ski Hill Place. I am pleased that you enjoyed everything on property and that it was "everything one and their family could hope for." Thank you for mentioning that there was no food available when you came. Please note that we serve breakfast, lunch and dinner from usually mid November through mid- April and then again from Mid-June to Mid- August. Other times we have a small continental breakfast available, as well as shuttles to town. I look forward to welcoming you back to One Ski Hill Place in the very near future. The level of professionalism here is great. The staff is courteous and accommodating. The views are spectacular no matter what season you're here, the facility is gorgeous and the skiing...what is there to be said about Breckenridge's skiing? It's okay. Haha, it's great. 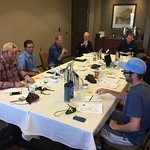 Thank you so much for your review of One Ski Hill Place and we enjoy being able to host your Board meetings. I am pleased to hear that you enjoy the staff, the views, and the facility. I look forward to welcoming you and the rest of the group back to One Ski Hill Place in the very near future.